HomeSingle ReviewsSingle Review: Big & Rich, "Party Like Cowboyz"
You know what you’re getting from the title alone. Suffice it to say that “Party Like Cowboyz” does not defy expectations in the least. be quickly forced out by layers of screaming bass and electric guitar. And yes, the lyrics are so forehead-slapping dumb as to make Toby Keith’s “Red Solo Cup” sound like a musical revelation. Yes, from the opening cry of “Come on, cowboys and cowgirls, it’s time to par-tay!” to the stupid “Z” slapped onto the end of the title, this is just bad, bad, bad. Big & Rich quite seriously sound like they’re not even trying anymore. It feels like there isn’t even any point in poking fun at this dreck because Big & Rich are making fun of themselves. This is the kind of schtick that I really think gives country music a black eye to those who might otherwise have gotten into it but, thanks to these clowns, probably won’t. And yes, Ben, “Zzzzzzzzzzzzzz” is absolutely right (IMHO). This was actually one of the better singles on their recent album. This song is decent if you try not to take it too seriously. And it also sounds like a song that would be great live. …i mean it’s rubbish, but good enough to be picked out of the musical garbage bin pretty early. this coma drinker’s lullaby should not be enjoyed sober. best just before passing out. liked the big toys line, but can’t see what it’s got to do with gasoline. wait, that comment will be coming from an overzealous fan, in which in all cases not me. Are they making parody of themselves? Anyway, this is going to be a flop. A big fat one, actually. They virtually always seem like a parody to me. The sad thing is, I don’t think they mean to. I guarantee that they weren’t singing “Save a Horse, Ride a Cowboy” seriously, this is just the natural progression of their outsized PARTYGUYS! personae. This review literally made me laugh out loud; nice work, Ben! 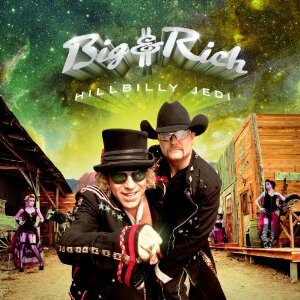 I was thrilled when Big and Rich went away for a few years; can this flop so they stay away for good? What is wrong with just cranking it up loud and pouring on the gasoline? It isn’t like every song out there has to have some deep philosophical meaning. Sometimes it is fun just to get out ther, crank it up to 11, and party like cowboyz. I think this is a fun rocking song. Nobody’s saying that Big & Rich have to be deep and philosophical, because I think most of us know that you don’t really use those terms to describe these guys. But I’ve heard infinitely better party records, country and otherwise, than this over the decades.